In a recent post annotating the second anniversary of this blog, I alluded to a "germ of an idea" festering in my mind, and if it had worked, I would've had an impossible situation for you armchair detectives to unravel – unfortunately, it proved itself to be untenable. If it had worked, the following would have transpired: a guest review from one of my fellow bloggers/mystery enthusiasts would've appeared discussing Janwillem van de Wetering's Een Oosterse huivering (An Eastern Shiver, 1980). It's a compendium of short stories in the vein of Edogawa Rampo's Japanese Tales of Mystery and Imagination (1956), but offering a wider selection of goods from all over Asia. The guest reviewer would've briefly touched upon all the stories, capsule reviews of sorts, as well as providing critical commentary on Van de Wetering as an anthologist – remarking how disappointing the reviewer was that he included stories by himself and Robert van Gulik but not one of Judge Ooka's cases by Bertus Aafjes. There is, however, something curious and faintly miraculous about this review: the anthology has only appeared in Dutch and the reviewer I would've picked does not speak that language! But before I pull a "Masked Illusionist," and reveal how this trick can be done, I'd like to point out that I have already furnished you with several clues. Oh, and shame on you, if you're the first answer that popped into your head was that I had "ghostwritten" the review or translated the stories. That would be cheating! So how can I make a person understand a language he does not understand for just this one book? The answer is as simple as it’s obvious and as Nathan Ford remarked on his own methods, "I just pretty it up a bit, add this and that," and how well it would've worked depended on the presentation – and the willingness of the sleuth hounds that roam this blog not to run straight for google. The biggest stumbling block in actually putting this up was the obviousness of it all, once part(s) of the solution clicks in place. And from there on, you can fill in the blanks. Let's consider the clues given in the summation above: it's a collection of stories from all over the Asian continent (e.g. Japan, China, India, etc.) and the absence of Bertus Aafjes. The first should’ve clued you in that they probably weren't original translations by Van de Wetering (who was also known as English/Dutch translator) and the second that, if this anthology had contained a Judge Ooka story, it would've been categorically impossible for anyone who doesn't understand Dutch to have read the book – because they've never been translated into English. 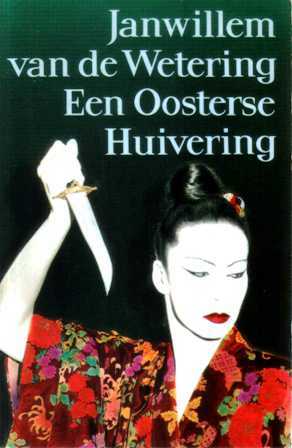 Van de Wetering culled these stories from pages of such collections as Ellery Queen's Japanese Golden Dozen (1978), Stories from a Ming Collection (1958) and Seven Japanese Tales (1963) and pieced them together as An Eastern Shiver. Never translated before or again... together... in Dutch. Hence my insistency on mentioning Aafjes, a distortion in the illusion that alludes to the truth, and the post-title. But this would have put a lot of work on the plate of my co-conspirator, who would've had to collect, read and review all the separate stories and that's just asking too much for something that can be solved in matter of minutes or even seconds. There was also the problem that one of the stories, a standalone by Van de Wetering, appears to be untranslated and that would've meant cheating on one of 'em – and that just isn't the sporting thing to do. Well, that was my idea for a "one-of-a-kind impossible situation" with the blogosphere and a creepy black-and-white picture of a dead mystery writer as a backdrop fizzling out into an off-hand dénouement, but I hope, at least, you found the idea of my Babel-Fish puzzle interesting or were amused by it. "Are we never to get out of the valley of fear?" It's September, 314 AD, when a fiendish ripper, known as the Nefandus, reemerges in the Caelian Quarter, "a rat warren of alleyways," after years of dormancy and vents his ire on the local prostitutes while tearing through the neighborhood. In another part of Rome, in far more august circles, Emperor Constantine and his mother, Empress Helena, are making plans for their empire, but not before smoothing out a few creases and turn to their trusted agentes in rebus, Claudia, for the job. Murder's Immortal Mask (2008) is a typical fair back in time, entailing practically all the elements, readers have come to expect from one of Paul Doherty's historical mysteries: like an uncaught murderer who crawled out of time's abyss and the recluse whose military past is the source of an all-consuming secret. Attius Enobarbus was a cohort of the fallen emperor Maxentius, snuffing out Christians and plundering their shrines during his reign, but times have changed and the only reason he's tolerated hinges on important knowledge he may possess – such as the secret location of the tomb of Peter the Galilean. But lately, Attius' wariness confined him to his chamber, which could double as a vault, however, secure and sealed rooms can be about as dangerous as a lonely track way – especially in Doherty's fancies. An assassin managed to slink in and out of the room unnoticed, stabbing Attius in the interim, but simplicity, if not to say banality, is the crux of the illusion here. I've noted before that Doherty's locked room tricks can be either simply clever or disappointingly simple, but the one he proposed here fits neither of those descriptions and felt like an inceptive idea that was left unexplored. I'm afraid this one was a bit too basic to meet my demands. Fortunately, Murder's Immortal Mask did not depend solely on the deliverance of the locked-room angle to succeed as a historical novel of crime. That was just one facet of the plot. The Nefandus' killing spree in the Caelian Quarter is somewhat reminiscent of Jack the Ripper's reign of terror over Whitechapel in London's East End of the late 1800s, and such persons, as Doherty remarked in his endnotes, must have existed in such places during that time. But what makes it interesting is how the Nefandus ties-in with the many twisted strands of this story, the dangerous, but colorful, backdrop it provides for Claudia and it's better clued than you'd expect – one clue a medical man gave on one of the Nefandus' victims was interesting to say the least. Well, it does give the reader a nudge in the right direction. 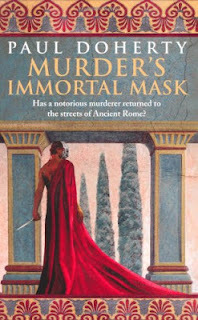 On a whole, Murder's Immortal Mask is a fun blend of the ratiocinative detective and the serial killer story, set during a tumultive period of political and religious upheaval in Ancient Rome, in which Doherty plays his formula like a violin – and should please fans of his work and this series. But to be honest, while not unsuccessful as a mystery, it was kind of bland and I haven't enjoyed this series half as much as those that follow Sir Hugh Corbett and Judge Amerotke around, but than again, that's personal preference speaking. And in case you missed it, I posted a notice of the two year anniversary of this blog a few days ago. "Lots of things take time..."
Celebrating with John Dickson Carr & Co.
On February 19, 2011, I posted a compact review of Pat McGerr's Pick Your Victim (1946), which was the first of many posts dripping into an ever-widening stain on the crime-orientated section of the blogosphere – discussing everything from locked room mysteries to foreign detective series. OK. Granted, not everything, but considering how classical my tastes are, I think I touched upon a wide variety of mysteries over the past twenty-four months. It's progress... for me. Anyway, I have nothing special lined up to mark this occasion, but I have a germ of an idea for a one-of-a-kind "impossible situation" that, if it works, will play out right here on this blog. I first need to check up on something and lay the groundwork, but even if it turns out to be impossible to pull off, I will let you all know what the plan was – including the solution. So for now, I want to thank everyone who has been following this blog, new and old, and I hope you'll all be on my tail for this third year of endless babbeling on detective stories. "Five people -- five frightened people. Five people who watched each other, who now hardly troubled to hide their state of nervous tension..."
Michael Carmichael was a man of great wealth and poor health, whose passing may proof to be very profitable for a handful of distant relatives, but the fine print has more in store for them than they originally bargained for – which does not even include the freak flood that cut them off from the outside world or the murderer prowling among them. This is a preliminary sketch of Zelda Popkin's Dead Man's Gift (1941), in which her department store detective, Mary Carner, accompanies one of the sale girls, Veronica Carmichael, to the home of her late benefactor in Pennsylvania. A journalist from the Morning Globe, who wrote up her story, found an inconsistency and advised her to take someone along – putting all the pieces in place for an old-fashioned game of who-dun-it. But what a nice collection of grotesque game pieces. The prospective legatees are a corpulent and gaudy "night-club derelict," Ruby, and a stammering farmer named Wallace. A former prizefighter who prefers to go by the name of "Joe Palooka" and a doctor of metaphysics, Cyril, who doesn't even have two pennies to rub together, but Carmichael left them each $250.000 (including Veronica). However, there's a catch (isn't there always? ): during the reading of the will by Eli Yarrow, friend and lawyer to the late Carmichael, they have to hear how every slice of the pie is topped with jocundly accusations (ranging from loose morals to murder) and accepting their inheritance means accepting the charges and certain scandal. But even less fortunate are Carmichael's sister and nephew, Tessie and Peter Whipple, who are mentioned but have nothing to show for it. Oh, and individual shares can swell if someone turns down or is unable to collect their quarter of a million of dollars, which Carner fears may be an incentive for murder when a flood ensures that they're at each others mercy for the next day or two. The flood does not pose a direct threat to the characters trapped in the house, as oppose to the raging forest fire in Ellery Queen's The Siamese Twin Mystery (1933) or the fortress under siege in Robert van Gulik's The Monkey and the Tiger (1965), but Popkin did a meritorious job in depicting its effect on the region – conveying a feeling of helplessness and furnishing the plot with a number of memorable scenes. News bulletins on the wireless are accompanied with requests for information on missing persons and local school turned into an emergency center. Classrooms are crowded with mothers feeding their babies, while in the Principle's Office a woman mourns the lost of her husband (drowned) with the physics lab turned into a make-shift county jail. As to be expected, one of them dies under very peculiar circumstances, hanged by the throat from the antlers of a stuffed wapiti, in a submerged staircase, but this murder is just a by-product of a far more ingenious murder – which, when it's finally revealed, turns out to be a cleverly disguised variation on the impossible crime story. One of the suspects blurts out that Carner's solution is "too fantastic," but it might work if the right circumstances align and Popkin did a bang-up job in making that situation sound completely plausible. All in all, an enormous improvement over the slapdash plotting in her previous outing, Murder in the Mist (1940), which I reviewed on here nearly two years ago. 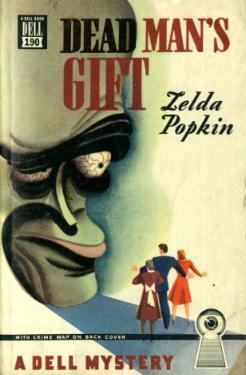 Zelda Popkin may not have been a contemporary rival of Agatha Christie and Christianna Brand, adepts of the closed-circle of suspects, but Dead Man's Gift is an interesting and well-done example of what many now consider a clichéd situation of a group of people isolated from the outside world – and it's slightly skewed approach makes it interesting for seasoned and beginning mystery readers alike. It's something pleasantly different without wandering away too far from the detective story. "This is your native country. It was you and your brothers, black and white, who let me come here and live, and I hope you'll let me say, without getting maudlin, that I'm grateful to you for it." Arthur W. Upfield was an English-born mystery writer who moved to Australia as a young man, where he wandered the outback as a jack-of-all-trades, before finally settling down behind his typewriter to carve out his legacy: twenty-nine novels featuring Detective-Inspector Napoleon "Bony" Bonaparte. Bony is an "half-caste" Aboriginal and somewhat ahead of his time, when he first stepped on the scene in The Barrakee Mystery (1929), as an educated and well-spoken man of mixed race who moved up through the ranks to become a DI – relaying on his wits as well as his aborigine tracking skills and hunting instinct. He's basically a predator in a suit and, as he describes his own behavior, has "...no respect for rules and regulations" or "when engaged on a murder hunt... no scruples and no ethics." Bony can stake out a spot for weeks, track a suspect for miles over sun-blasted plains and read the behavior of animals to find water or bodies. A method of detection that's amplified by Upfield's talent for painting, like an Old Master, the landscape of his adopted country with words. This already resulted in three unusual, but original and memorable, detective stories. Death of a Lake (1954) takes place around a draught stricken area where a dying lake is about to give up its secret. Man of Two Tribes (1956) has Bony exploring the desolate Nullarbor Plain for an acquitted murderess who wandered off a train and The Valley of Smugglers (1960) is more a Doylean novel than a mystery (i.e. 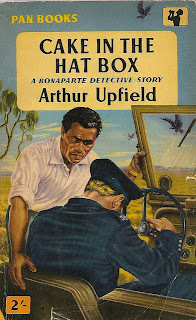 second part of The Valley of Fear, 1914), but Cake in the Hat Box (1954) is the best one yet – in which Upfield evidently had more consideration than usual for the plot while continuing to sketch some striking scenes. Agar's Lagoon is a small, dried up inland desert settlement hemmed-in by an ever-widening ring of empty bottles, estimated to total a thousand tons, because it's economically unprofitable to return them. Constable Martin Stenhouse presides over this district and is considered competent, but neither admired or loved, which leaves few to mourn him when a truck driver announces that he found Stenhouse, shot dead, sitting in his jeep on the road to Agar's Lagoon – and his Aboriginal tracker, Jack Musgrave, is missing and presumed guilty. The murder of Constable Stenhouse appears to be a close-and-shut against Musgrave, with his apprehension and conviction only a mere formality, but Bony's keen eye for detail spots a few inconsistencies and proves a set-up. However, he's not the only one looking for justice as smoke signals tell him that the natives may be looking for their own particular brand of justice for Musgrave. It's not just a case of catching whoever's responsible for the murder of Stenhouse and the disappearance of Musgrave, but doing it before a spear does, which, I have heard, are very hard to outrun. Cake in the Hat Box is a wonderful tour of a dusty nook of the Australian continent, from the desert lagoon with its halo of glass to meteorites streaking across the night sky, becoming through Upfield's words almost a character in itself – populated with the kind of unusual, often rugged outback people you'd expect to find in a place like that. But the finishing touch was a satisfying, twisty plot that had a delightfully classic surprise in store that I didn't saw coming. Upfield proved in Man of Two Tribes that he had a wealth of imagination and here he showed he also knew what to do with it. In closing, the back cover of Cake in the Hat Box asks: Are YOU an Upfield fan? My answer: I'm getting there! "He thinks he's Sherlock Holmes in the flesh." In November of 2011, I reviewed Carpenterand Quincannon: Professional Detective Services (1998), a collection of short stories originally penned during the 1990s, in which John Quincannon abandoned a dwindling career with the United States Secret Service to begin his own detective agency with Sabine Carpenter, a former Pinkerton operative, in San Francisco of the 1890s. 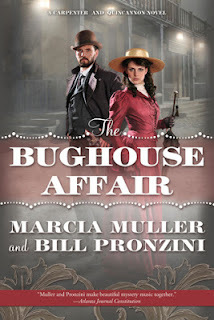 The collection turned out to be a splendid farrago of period stories filled with colorful character and beloved tropes that trudge around in evocative settings, but the finishing touch came when Bill Pronzini informed me that he and Marcia Muller were collaborating on series of Carpenter and Quincannon novels – and gave me permission to announce The Bughouse Affair (2013) and The Spook Light Affair (2014) to the public. And yes. Considering the fact that I had the scoop, I should've reviewed this one a lot sooner. I was late with placing the order, and when the book finally arrived, I was deeply immersed in Jan Ekström's Deadly Reunion (1975). But enough excuses. In this first of what's hopefully to be an annual affair, Carpenter and Quincannon have separate assignments to take care of that are a part of the daily routine of a detective agency. Sabina has to snuff out an elusive and particular nasty pickpocket from the crowds patronizing an amusement park, a torch-lit bazaar and the throng of people walking the evening Cocktail Route, but the trail soon leads away from San Francisco's entertainment district to a seamier part of town. And a rather nasty murder. Somewhere else, John Carpenter is spending an uncomfortable evening in the shrubbery to stake out a house, in the hopes of catching a burglar in the act, but when his reward is almost within in his grasp he lets it literally slips through his fingers. Oh, and he's also held at gunpoint, mistaken as a fleeing thief in the night, by a venerable colleague from England. Or at least he claims to be. During the opening of The Bughouse Affair, a newspaper scribbling by Ambrose Bierce touted that the world's most-celebrated detective, Mr. Sherlock Holmes, has emerged from Reichenbach Falls and found his way to their city where's spending a period of leisure a the home of a prominent family – who happened to be neighboring the burgled house. 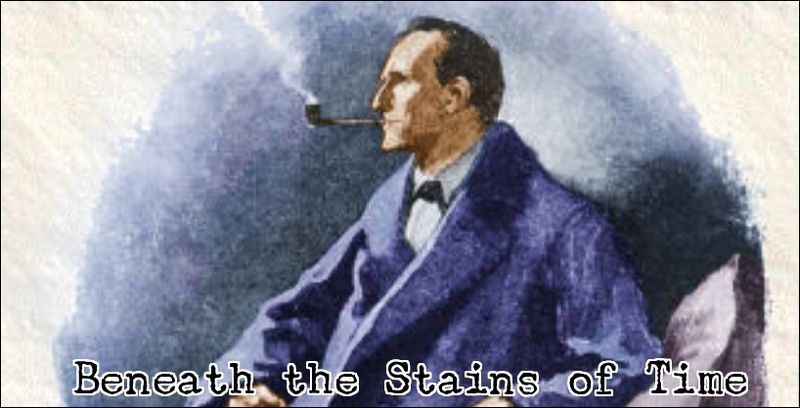 Quincannon shares Bierce's opinion that he's a crackbrain, adding that he also has the routine of a conman, and that appears to be the opinion of everyone who's aware that Sherlock Holmes disappeared alongside his arch nemesis in the gorge of Reichenbach Falls, which makes it even funnier if you imagine Jeremy Brett as the bughouse Holmes. Whether he's an impostor or the actual Sherlock Holmes, he's playing the role like a violin, and even accompanies Quincannon on his next stake-out, where the case goes from bad to worse after the furtive burglar assaults the owner of the house – leaving him dead inside a locked room and than manages to disappear from the house unseen! Pronzini usually dabbles in two kinds of illusions: practical ones that might actually work off-page and complex trickery that would not disgrace the stage of a famous illusionist (e.g. "The Arrowmont Prison Riddle," collected All But Impossible, 1981). I won't divulge under which header I place this impossible crime, but I definitely enjoyed it. Now that I think about it, the only one of these kind of stories (by Pronzini) that I disliked was "Proof of Guilt" (collected in Murder Impossible, 1990), which left me under whelmed after the editors praised it as "one of the very best impossible shorts written over the past 50 years." The solution was also a take-off on a trick that I loath and, IMHO, as dated as poisonous snakes and trapdoors. I hated it when Clayton Rawson used it and hated when Pronzini gave it a spin. Not to mention that Pronzini wrote at least a handful of other impossible shorts that were miles better (e.g. "Where Have You Gone, Sam Spade?" and "Booktaker," collected in Casefile, 1983, or "Medium Rare" in the previously mentioned Carpenter and Quincannon: Professional Detective Services). Anyway, back to the review at hand! As to be expected in a detective story, evidence from Sabina’s pickpocket case turns up in Quincannon’s investigation, and slowly, everything begins to come together in a most satisfying way. The manner in which Quincannon, Sabina and the presumptive Mr. Sherlock Holmes take part in the explanation was very reminiscent of Leo Bruce's Case for Three Detectives (1936) – especially how the bughouse detective's solution echoed one of the tales from the canon. A conscious nod to one of their predecessors whose most famous novel is also one of the most successful parodies of the storybook detective ever written? The Bughouse Affair is more than just flight-of-fancy through a time and place now long gone by, however, the busy tourist strip, chute-rides at the amusement park, fire-lit bazaars, crowded brothels, moldy pawnshops and the many gaudy underworld figures that populate this story adds color and details to an already imaginative and absorbing plot. If your taste runs in the direction of a classically-styled whodunit, inexplicable crimes committed in sealed rooms, Holmesian pastiches and/or historical fiction than The Bughouse Affair is your book and I recommend you track down a copy ASAP. It might give publishers an incentive to publish more of these stories. "To know that one of your relatives is a murderer is bad enough..."
With a nickname like the "Swedish John Dickson Carr," it was inevitable that Jan Ekström's Ättestupan (Deadly Reunion, 1975) ended up on my prodigious pile of books to read, but as John Norris from Pretty Sinister Books pointed out in his review, it has more in common (stylistically) with Ross Macdonald than Carr. 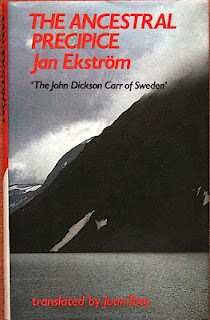 However, the plot's exposition is as clever and twisty as those of Ekström's predecessors, and I would place the book a lot closer to Christianna Brand than Carr – who provided a wonderful blurb for this novel, "a beautifully twisted, many-colored skein which it was a pleasure to try to unravel." Do I agree with her. Yes! Let's find out. You could call Aunt Charlotte Lethander blessed, an elderly woman of great wealth whose ninetieth birthday is looming, and has one more thing to accomplish in her life time: consolidating the three warring branches of her family and summons them to her home. And they come swooping down like a flock of vultures. John mentioned "the story is filled with the kind of brooding aura and dark family secrets that fill the cases of Lew Archer," and this style is apparently quite common in Scandinavian crime fiction, but this dark and brooding ambiance also reminded me of the German TV-krimi Derrick – in particular the episode Der Fall Weidau (1986). Contrary to the usual tone of the series, Der Fall Weidau had a classically-structured plot in which the dour-looking Oberinspektor of the Munich Kriminalpolizei, Stephan Derrick, has to visit a country estate to look into the poisoning of a young family member and I suspect that the ending was made as depressing as possible to make up for any fun viewers may have experienced while figuring out who-dun-it. Ekström's story is more tragic than depressing and a clever one at that. Problems arise when Victor Bernheim, a womanizing photographer, runs low on funds and decides to cash-in on a "security," a letter containing incriminating information, which he offers up for sale to his father, Martin, for the sweet sum of 15.000 kronor. What we have here is a classic set-up for an old-fashioned murder, however, it's not a case where the blackmailer or the victim is rubbed out... but both of them! On first impression, there is nothing to dispute that Martin, after having shot Victor, locked himself into his bedroom and took his own life by filling the room with the noxious fumes from the bedside fireplace, but Bertil Durrell agrees with the opinion of the family that there's more to it than just a simple case of murder/suicide – and soon uncovers evidence to support their theory. But a lot of those clues make the affair look even twistier and more impossible than when they first assumed foul play. The gun found in Martin's room is not the murder weapon and the damper was open, making it impossible to die of carbon monoxide poisoning, but that’s how Martin died. The smoldering family secrets, brooding relationships, rivalries and even an unresolved death from the past, which all may have a bearing on the murders of Victor and Martin – showing why I think Deadly Reunion is closer to Brand than Carr (e.g. London Particular, 1952). Brand's stories usually concern a closed circle of suspects that drive the plot and she turned her hand to the locked room from time to time. If this was a Carrian story, the ancestral precipice and its ghostly legends would've been a more prominent presence in the book, than just a story from an old lady, and probably have been the backdrop for a spine-chilling scene, played out underneath a pale moon, before the murderers downfall. I can only imagine what Paul Halter would've done with the death of Stella Corn, who was found at the foot of the precipice several years before the opening of this story, which he would no doubt turn into an impossible murder. Definitely not a Carr, but the solution to the locked room doesn't disappoint nor does the rest of the explanation. I can recommend Deadly Reunion to anyone from ardent whodunit fans to avid readers of crime/thriller novels. 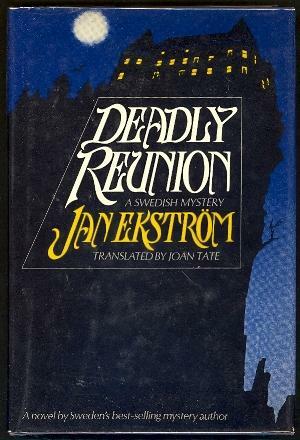 Jan Ekström appears to have been a part of an international wave of mystery writers, emerging on the scene during the 1970-and 80s, who made an admirable attempt at bridging the gap between the detective stories of yesteryear and contemporary crime novels. Not surprisingly, these are the mystery writers from the post-Golden Age period that I enjoy the most, but alas, their voice was not the prevailing one. But it does make one wonder... did the Silver Age we've all been longing for passed-by unnoticed, decades ago, like Chesterton's "invisible man"? Or did the deluge of spy and thriller fiction act as Carr's "silver curtain"? On the upside, we seem to be in the spring of another, brighter period for the traditional detective story and the next book on my pile may end up proving that we're on the right track. Oh, and yes, despite my hammering that Deadly Reunion is not really all that Carrish, I still picked "The Golden Hag" as a post title, but how could I not, after the fabulously rich Charlotte Lethander uttered "for an ancient hag it would be eminently suitable" and better than "Lock, (Family) Stock and Two Smoking Barrels."